What do physics and dance have in common? Albert Einstein didn't have anything to say on the subject as far as we know, but Marly Spieser-Schneider has set out to prove that the two are a match made in heaven. 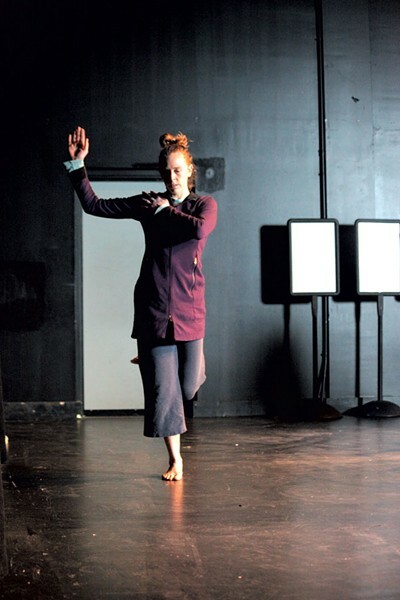 The Burlington choreographer will present a work-in-progress on Wednesday, April 1, at the FlynnSpace. The Vermont Artists' Space Grant she received from the Flynn Center for the Performing Arts afforded her 60 hours of creation time over 10 weeks, as well as an informal public showing. The grant challenges artists to focus on their creative process rather than on the presentation of finished, polished pieces. Spieser-Schneider, 27, whole-heartedly embraces this concept, and her choreographic artistry reflects the malleable evolution that often characterizes a work-in-process. "My intrigue lies in the innate, functional movements that define us as human as well as the many varied physical skills we are able to practice and hone," she explains in a release describing the upcoming show. Spieser-Schneider adds that what intrigues her most is not the perfection of form dancers can achieve but the process that occurs in the rehearsal hall, backstage and when no one is looking. "Sometimes even more fascinating are our blunders, missteps, miscalculations and how we adapt them," she writes. The choreographer graduated from the University of Michigan in 2009 with a BFA in dance. She then traveled around that state teaching, performing and producing, before making her way to Vermont in 2010. Locally, Spieser-Schneider has performed with formerly Middlebury-based Tiffany Rhynard's Big APE (Big Action Performance Ensemble) and appeared in Hannah Dennison's Dear Pina, in addition to works by local dancer-choreographers Paul Besaw, Clare Byrne, Hanna Satterlee and Toby McNutt. "My dance influences range far and wide, from tappers like Gregory Hines and Savion Glover to modern dance companies like Batsheva and Urban Bush Women," said Spieser-Schneider in an interview. In Vermont, she founded Marly S. Danceworks, her platform for choreographic and performance-based projects. The muse for her upcoming FlynnSpace performance is Einstein's Dreams, a 1992 novel by Alan Lightman that Spieser-Schneider received as a gift from her mother, a science teacher. The book consists of 30 dated vignettes (the fictional dreams) that serve as analogies for time; that is, Einstein dreams night after night of different worlds where time exists in entirely unique ways. In one vignette, time stands still in the center of a town and grows faster the farther away its denizens venture. In another, people are stuck, forced to relive a single moment in their past à la Groundhog Day. Einstein's Dreams was an international best seller and translated into 30 languages. Intrigued by several of its chapters, Spieser-Schneider decided to translate Lightman's prose into dance. Her performance is titled 3 May 1905, inspired by certain chapters in the book that suggest cause and effect are erratic and that, at times, effect precedes cause. Spieser-Schneider and six female dancers have been working with what she calls "phrase work" and "structures." The result is a mesmerizing and lyrical work that melds movement, scientific theory, pattern, spatiality, grace and an element of chance. "I appreciate well-rehearsed, unison movement onstage," Spieser-Schneider said during a break in rehearsal last week, "but I am also really interested in the idea that humans have an amazing ability to both retain and remember movement and replicate it, but also to be really spontaneous and reactive." One of the two dances included in 3 May 1905, "Stuck," is a sequence in which the dancers are assigned unique phrase work and paths. One dancer becomes "stuck" in a moment (not stationary, but repeating one or two movements like a skipping record). The other dancers must, one by one, make transitions into their own "stuck" actions, and remain that way until all dancers are in their individual repetitions. When that happens, everyone is free to continue on with her own trajectory. If this sounds complicated, it is. The interdependence forces the performers to be keenly attentive to one another's movements and respond accordingly. "The last stage of this exercise is that all dancers try to get stuck and unstuck together," Spieser-Schneider said. "If this does not happen on the first attempt, they try again. Once it does happen, the piece is over." In "River," the choreographer plays bumper cars with the dancers, enacting Lightman's notion that "In this world, time is like a flow of water, occasionally displaced by a bit of debris, a passing breeze." Spieser-Schneider arranges her performers in a narrow corridor, perhaps representing a river. Dancers who accidentally make contact with other dancers become "displaced" and must leave the corridor and run back to their starting points. "The goal is for all dancers to get offstage, and, depending on the level of contact between the dancers, the piece could last three minutes or 15," Spieser-Schneider said. The element of chance makes for an unpredictable viewing experience. Spieser-Schneider's plans for a musical soundtrack are still evolving. "We have been working with a lot of Tom Waits and Taj Mahal in rehearsal, but we may very well use a different piece of music every time we perform the piece," she said. Blues music helps her dancers find the right sensation for the piece, she explained, which involves sinking into the movement rather than feeling confined. John Forbes was also at the rehearsal last week. The associate professor and resident lighting designer in the University of Vermont Department of Theatre intends to use video projections, filmed and edited by Spieser-Schneider, as lighting sources. "I'm interested in digital media and how you use projections as lighting sources on the dancers," he said. One video is a time-lapse sequence of the morning sun casting light into a room. "When the author of Einstein's Dreams talks about light, he describes how things appear out of nowhere," Forbes said. "You start to see shapes and details. I was captivated by his writing and by this idea, which inspired us to try and create this revelation of form slowly, subtly." Spieser-Schneider has designed the FlynnSpace performance to engage the audience in her process. During an intermission, the dancers and choreographer will review the performance and try some phrases again. "There is an urge to create something polished and beautiful, but that's not the point with this work-in-progress," she said. "It would be cheating to cut the audience out of the creative process." In turn, viewers can expect to come away from the performance with a deeper understanding of and appreciation for how dance pieces are created. Spieser-Schneider said the most rewarding dances she's performed were ones that "fried my brain as much as my body, and when it comes together, it's amazing." No fooling: This April 1 dance performance will spotlight the fusion of body and brain. The original print version of this article was headlined "When Physics Meets Dance"